The Kimber Solo was built for self defense and is a great option for an everyday carry pistol. 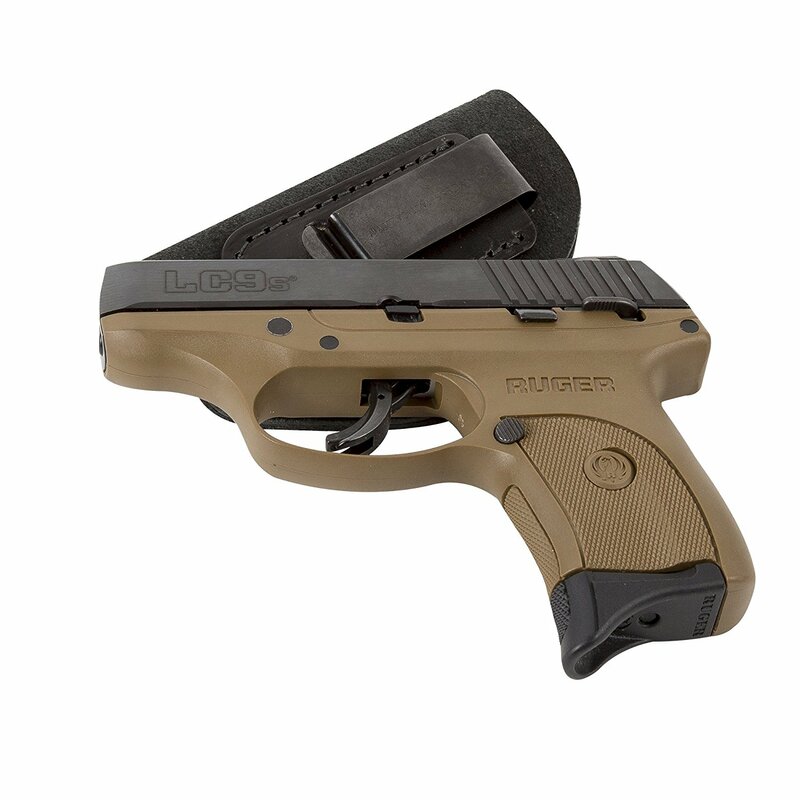 The size may be slightly large for pocket carry but this handgun is perfect for IWB concealed carry. This little beauty was made slick. There’s nothing on the frame that would drag or snag. The frame is perfectly balanced with texture that grips skin but not clothing material. Even the sights are optimized for quick draw from a holster. Everything about this design has concealed carry and self defense as the primary reasons this gun was made. There are lots of holsters out there. After doing some research, I have found the Relentless Tactical IWB Holster to be a nice choice for the Kimber Solo. This holster is a well made product. Hand crafted from genuine suede, it is very comfortable and forms to your body. As you carry your trusted firearm you don’t want a flimsy holster. You want quality and functionality to be optimal and the Relentless Tactical fits the bill. There are other options out there that made the top picks and I’ll share those in a bit. First I would like to share some things for you to consider as you are in the process of researching a good holster for your Kimber Solo. As you are researching available holsters for your handgun, there are things you will want to keep in mind. Choosing a holster can be a huge process, especially for a new shooter. Concealed carry is about different pieces of a puzzle rather than a couple stand alone items. Some things to consider could be, do you want to carry inside the waistband or outside? What position will you carry in? What type of clothing will you typically wear as you carry? How will you carry extra magazines? How much can you spend to get quality gear that will not fail you if you are ever put in the position to defend yourself or another? If you want to carry concealed or if you live in a state that requires your gun to be hidden at all times, concealability definitely plays a major role in the things you will be considering. Sure, you can dress around your sidearm, but wearing a good holster helps you conceal more comfortably. You will want a holster that will fit your body, in the carry position you desire, that works with the type of clothing you’ll be wearing. You want the holster to fit close enough, to your body, to minimize printing through your clothing and fit securely on your belt. A belt may be thought of as a small part of the wardrobe but it does play a bigger part when you are carrying. It is a piece of that puzzle we referenced earlier. There seems to be two different types of gun belts. There are ones that are more tactical or sport- type, and used for a day on the range. Then there are ones that have a more classic design that will look right in a business or social setting. The latter are the ones you would consider for a concealed carry situation and are the ones this article is focusing on. It is very important to have a good gun belt for concealed carry. A belt that is not sturdy enough for a holster will impede your ability to draw your weapon, especially in a dynamic situation. Department store belts are not built for carrying a gun. They are made with style and holding your pants up as the goal. Gun belts are designed to bear the weight of a holster and gun, and to be stiff enough to not bend or twist while drawing your weapon. Accessibility is an important thing to consider while you are shopping for your holster, and is influenced by concealability. You need to be able to access your firearm easily and quickly, as your life, or the life of someone around you, may depend on it. For inside the waistband, concealed carry, level one retention is probably adequate for most. You want to be able to draw your weapon and re-holster it, one handed, quickly and smoothly. You want the balance of security and ease of accessibility. Level one retention, or passive retention, happens by good old fashioned friction. In a holster that is leather, it is enhanced by the holster being molded to the make and model of your gun. After the initial break in period, retention should be at it’s best and can be kept this way for many years with occasional leather treatments, if the holster is made from a good quality leather. Thermoplastic holsters, like Kydex, do not naturally grip the handgun like leather but use screws to tighten or loosen the grip. The holster is molded to your handgun make and model but you decide where the optimal grip is by the retention screws. There are different levels of retention for different security levels depending on your carry needs. Comfort is all about your personal opinion. We all know, if it’s not comfortable, you will not wear it long term. Some new inside the waistband carriers may find that it can be uncomfortable. It may take some time to get used to it. This is another area where you don’t want to skimp. Not only will it hurt you physically, but it will hurt the wallet too, if you keep buying poorly made holsters. Position of carry is another thing to consider as you think of comfort. There may be positions that you may love while walking or standing but can not be tolerated if you sit for longer periods of time. This will take some experimenting on your part. Last, but certainly not least, you do need to consider price. This is an area where you want to get the best deal out there but you don’t want to skimp quality. This is where my top picks can really help you. I have researched various holsters for the Kimber Solo and came up with this list of quality holsters that may be really good options for you. Our number one top pick is the Relentless Tactical IWB Holster. This holster can be trusted at that crucial time of need. High quality suede is handcrafted into a durable and comfortable holster. 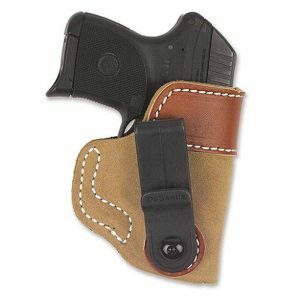 This holster combines all the best features of quality, comfort and function. It’s very affordable yet does not skimp on quality. The Ace-1 comes with Black Arch’s Variable Stiffness Backer, or VSB. They describe this as a double leather face with a polymer ”stiffening” insert and a suede backing. This combo provides a sweat proof barrier between you and your gun yet it is still flexible enough to move with you. This is a very comfortable holster. 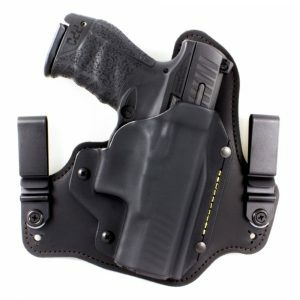 This holster, with an adjustable cant, can be worn cross draw, strongside or small of back. It is made of suede with leather reinforcement. This is a IWB tuckable holster. This is a kydex holster. It is lightweight, easy to use and seems pretty comfortable. Affordability and good quality go hand in hand with this one. There are many options for you out there and searching for the best holster for your Kimber Solo may be a large undertaking. As you can see, there are many things to consider. The Ultimate Suede Leather IWB Holster offers classic American craftsmanship, combining function, comfort, and durability. Hand made from genuine USA suede leather, The Ultimate Suede Leather Holster is the ultimate “inside the waist band” concealed carry holster. I found the Relentless Tactical IWB Holster to be the best option for the Kimber Solo. It is strong, reliable and lightweight. 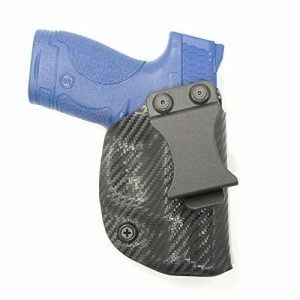 Made with high quality materials, this holster will give you great carrying ability year after year. I hope you found this review valuable and has helped you with the decision that you need to make to pick the best holster for you.